The Community Seed Network (CSN) is a place to celebrate seeds and community. 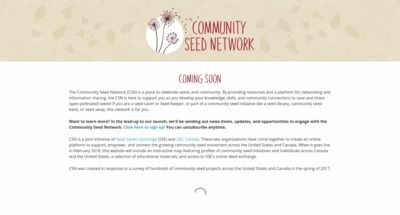 By providing resources and a platform for networking and information sharing, the CSN is here to support you as you develop your knowledge, skills, and community connections to save and share open-pollinated seeds! If you are a seed saver or Seed Keeper, or part of a community seed initiative like a seed library, community seed bank, or seed swap, this network is for you.